MANILA — As host, the Philippines is expected to win more medals if not claim the overall championships of the 2019 Southeast Asian Games slated from Nov. 30 to Dec. 11. 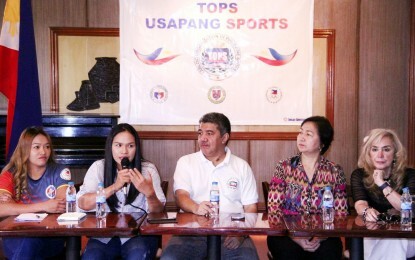 “Pinaghahandaan na ng Muay Association of the Philippines ang darating the SEA Games kung saan may 11 events ang muay (The MAP is already preparing for the upcoming SEA Games where there 11 muay events),” national coach Preciosa Delarmino said during Thursday’s “Usapang Sports” hosted by the Tabloid Organization in Philippine Sports (TOPS) at the National Press Club in Intramuros, Manila. “We have a chance of winning the gold in more than half of the events, especially the women events,” she added. Delarmino was joined in the weekly forum also supported by the National Press Club and the Philippine Sports Commission by Mardel Claro, the country’s first international muay technical official. Claro said that MAP has lined up a series of tournaments here and abroad to fine tune the SEA Games-bound muay athletes. Claro said all the medalists will compete in the national championship which was moved to February due to the SEA Games schedule. For the fourth time, the Philippines will host the SEA Games with many of the events to be held at the under-construction New Clark City in Capas, Tarlac.